This topic contains 3 replies, has 2 voices, and was last updated by f1nutz 6 months, 1 week ago. Using the same wheel I’ve taken two of the 20 spoke inserts and sanded one (the white one in this example) down to a thickness of approx. 1mm and placed it behind an original sized insert (the grey one) to see how it looks. You be the judge. It took me approx. 5 minutes to do this using both a coarse grit sandpaper, finer sandpaper and a sharp exacto knife. For best results I would suggest that you spray both the spoked inserts with your choice of Tamiya TS (or airbrush acrylic) and the wheels. Adding a black or dark grey wash (or any contrasting colour) to the inside of the wheel will make the spoke detail pop. So this is a fourth insert alternative for those of you building models for the Coppa. 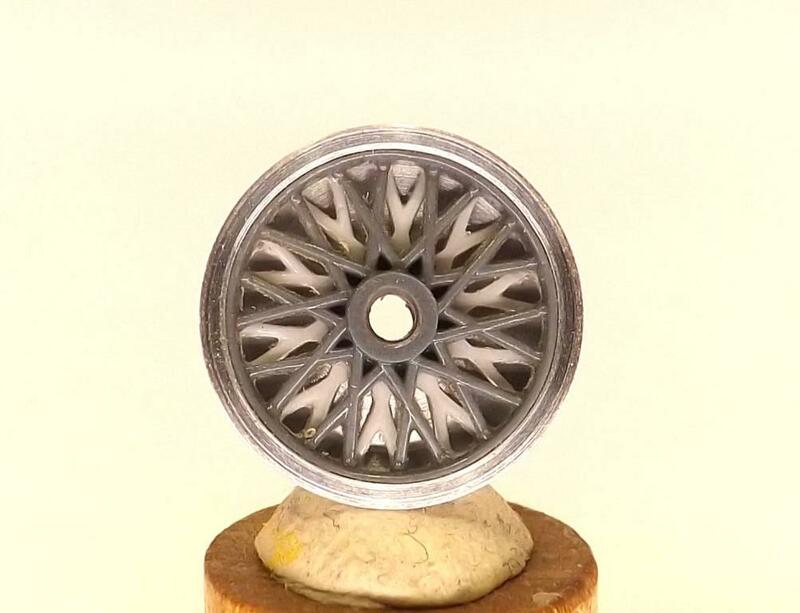 I’ll be using this technique for both the Alfa 8C and the Mercedes SSK wheels that I am preparing for myself. Sweet! What number are you putting on your SSK? Just so I don’t use the same one. Good to know. Doubt mine will be ready any time soon anyway.